Q: How do your prices and services compare to other Houston contractors? A: Simplicity Bath is unique in that we are a specialty contractor focused on quality and the customer experience, rather than “burn and churn”-type work. Since we do one thing only – bathroom remodeling – we work with customers who value our expertise and are seeking a reliable partner for their bathroom project. Our prices reflect the professionalism, personal service, and attention to detail that are our hallmarks. Regardless of their differences in home value, project size, and budget, our customers all think of their bathroom as an important space and won’t entrust their project to just anyone – they are looking for a great fit rather than a low price number. Our customers appreciate QUALITY and only want to do their job once. Q: Are you one of the companies that only does big, fancy jobs? A: No, we complete jobs of all sizes – from $2,500 to over $100,000, with many customers spending somewhere between $10k-30k on a project. Just like people, bathroom projects vary widely in size, shape, and scope. Q: What does a bathroom remodel cost? A: According to the Remodeling 2017 Cost Vs. Value Report, a mid-range, pull-and-replace guest bath remodel with very basic finishes averages almost $17,000 in the Houston metro area. The following are two excerpts from the report, which is published by Hanley Wood. © 2017 Hanley Wood, LLC. 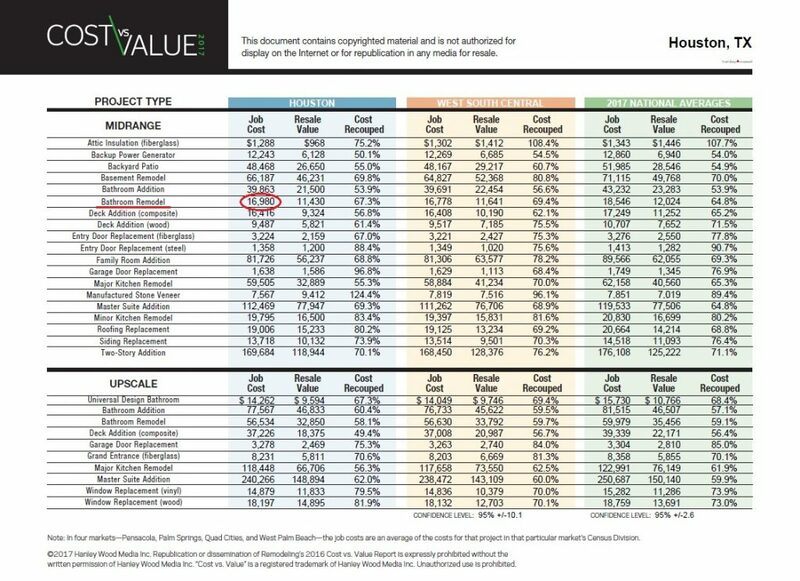 Complete data from the Remodeling 2017 Cost vs. Value Report can be downloaded free at www.costvsvalue.com. It is not hard to meet or exceed this amount when working with a professional bathroom remodeler. In fact, we’ve built many custom showers alone that exceeded this. However, we’ve also completed many smaller projects below this amount, including some very popular tub and shower remodels, and even some budget-friendly guest bath remodels. 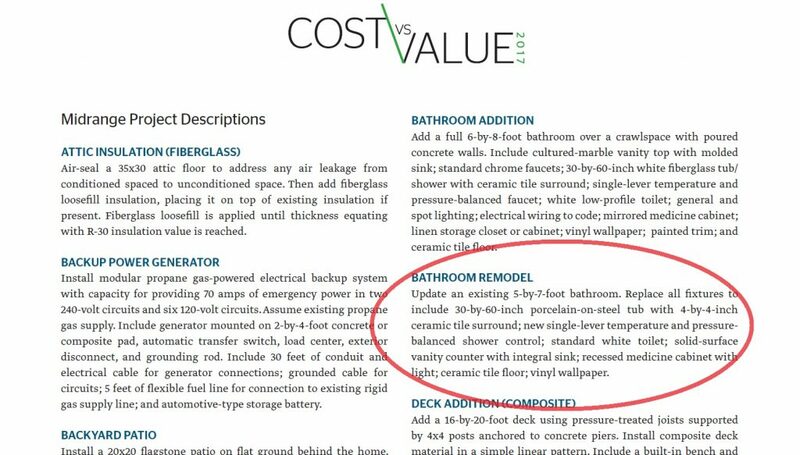 According to this same Cost Vs. Value Report, an upscale master bath remodel averages around $56,000. With this in mind, we suggest that folks wanting to undertake a full-scale master bath remodel budget at least $40,000, and for fully-custom master bathroom projects, the sky is truly the limit – some of these jobs end up well over $100,000. Level 1 $2,500 – 8,500 Vanity replacements, vanity top and sink faucet replacements, bathroom floor replacements, minor cosmetic updates. Level 2 $8,500 – 17,000 Most tub or shower remodels, walk-in tubs, some limited-scope guest bath remodels. Level 3 $17,000 – 28,000 Typical guest bath remodels, custom shower projects, handicapped-accessible bathroom remodels. Level 4 $28,000 – 40,000 Upscale guest bath remodels, typical pull-and-replace master bath remodels, large or upscale custom showers. Level 5 $40,000-100,000+ Typical custom master bath remodels and upscale master bath remodels. In order to develop a price for your project, the first step is to determine your scope of work and desired finish level (for example, are you just looking for a basic, functional tub to shower conversion or are you wanting a complete makeover of a guest bathroom with upscale fixtures and custom tile work?). This will help narrow down a general budget range, and from there, we can work together to define the particulars and select the exact materials, colors, and finishes to build out your project. Give us a call when you’re ready to get started. Q: Do you guys offer financing or payment plans? A: Yes. We offer low-interest, no-interest, and fixed-rate payment plans with approved credit, and we work with several different lenders to help our clients achieve a great bathroom remodel on terms they can afford. A: Unless you’re only looking to have one or two small items addressed, this is really a DIY budget. DIY, or Do-It-Yourself, customers often seek big changes on a small budget, and will need to do most or all of the work themselves to realize this. Our customers are in the DIFM – Do It For Me – category, and are seeking the services of a fully-insured company with trained and experienced personnel. Do-It-For-Me customers hire a company like Simplicity Bath because they want to avoid the numerous risks, quality concerns, and management hassles associated with hiring individual tile guys or generic contractors for their important bathroom renovation. For a good idea of where pricing starts for professionally-remodeled bathrooms, see the article referenced above from CostVsValue.com. Q: We have elderly relatives moving in now, so we need a standard-size tub taken out and a walk-in shower installed ASAP. How quickly can you turn around a project like this? A: We understand that life sometimes creates time-sensitive remodeling needs, so we work very hard to meet deadlines for clients in “pickle” situations. We can usually accommodate requests like this, depending on the scope of work and materials desired. Please bear in mind that a tight time horizon will limit your material choices. If you are in this kind of situation and need service fast, call us and we will do our best to work out a solution for you. Q: We need a shower remodel with a very low height step for my mother, who is almost 80 years old. What is the lowest height you can build the step? A: We can build your step, or threshold height, anywhere from 0” to 5” high, depending on the style and material of the shower floor you select – and we offer tile, cast iron, acrylic, and solid surface shower bases. Some of our clients need a roll-in or ramped threshold for handicapped or wheelchair accessibility, and we can accommodate this as well. All of our solutions for these kinds of situations are designed with non-slip floors to provide maximum foot “grip” without sacrificing ease of cleaning. Q: We’ve had tile for years and we’re tired of the maintenance. What do you offer that is easier to clean, but isn’t a “faux”-looking product or a thin plastic? A: We hear this often, and we have several solutions. Your lowest-maintenance options are going to be our solid wall systems, with each wall comprised of one slab of material, rather than many small sections pieced together (as with tile). While eliminating all maintenance is impossible, our panel and slab systems are far and away the easiest-to-clean shower and tub surround options. We offer several different versions of these systems, ranging from 3/8” solid surface panels to custom thin stone slabs which can be backlit for an extremely unique, modern look. We do not offer plastic “cover-up” products that are installed on top of old tile. For customers who want to stick with tile, but still want to cut down on cleaning hassles, there are several things we can do to reduce the overall maintenance of a tile shower. For some customers, we will install a solid shower base to reduce shower floor maintenance, while keeping tile for the walls; for other customers, we’ll install tile for both the floors and walls, but reduce the size of the grout lines while increasing the size of the tiles. In addition, we offer several high-end grouts which are easier to clean and maintain than standard grouts, and we exclusively install pure silicones for all corners and expansion joints. Q: We are looking for custom tile, but it looks like you guys do a lot of panel systems. We don’t really want any kind of “insert” product. Do you also offer tile? A: Yes, we do a ton of tile work. Better yet, we do it differently, and better, than the industry standard. Ever notice how there are a lot of complaints about tile failures out there? That’s because the vast majority of tile work is not properly waterproofed! Our tile customers can rest assured that we observe industry best practices (the exact opposite of “industry-standard” practices), and adhere to TCNA guidelines for our tile shower installations. TCNA is the Tile Council of North America, an organization which has created, managed, and updated the highest level of tile installation standards for decades. Most tile installers have never heard of the TCNA. For homeowners who want tile showers, walls, and floors, we begin our process, as always, by offering guidance and education. For example, some of the nicest-looking and most stylish tile installations are also the highest maintenance – especially within wet areas. For some homeowners, this isn’t an issue. For others, the maintenance and higher cost of tile installations for shower walls and floors is a turn-off, which is why we also offer our stone and composite slab wall systems. Whatever you’re looking to accomplish in your bathroom, give us a call and we’ll do our best to help you find an attractive, long-lasting solution! Q: I’m only looking to replace a countertop and sink fixture in my guest bathroom, and I want to leave my existing cabinets alone. Is this too small a job for you? A: No – we are happy to do these smaller projects. While we often replace vanity tops as part of larger jobs, we do offer standalone vanity and vanity top replacements in Houston and the Woodlands. We have four different lines of countertops for you to choose from, and many different faucets with lifetime guarantees. As always, your sink fixture will be installed by a licensed plumber, rather than an installer or handyman. A: Yes we do, and we’re here to help. If you have any trouble with a product we’ve installed, give us a call and we’ll get you squared away. For most of our products, the manufacturers will send us a replacement part, and we’ll schedule your installation once it arrives in our hands. Q: We heard about this company that puts a product right over my old tile, do you have anything like that? A: No, and for good reason. If you have rotted studs, pest problems, mold, or plumbing issues, these will persist after your new plastic cover-over or spray-on is installed. Since we are in the business of doing things correctly, rather than cheaply, we do not offer thin plastic “cover-up” products that do not address potential issues behind the walls. Give us a call if you’d like to discuss a complete tub or shower replacement, with a full tear-out and rebuild using dust-conscious work practices and higher-quality building materials such as tile, stone, or solid-surface panels. Q: I bought a flip house and I’d like to have you guys remodel the bathrooms. I’d also like you to do some tile work in the bathrooms at a restaurant I own. Can you help? A: Of course! Although many of our clients are residential homeowners, we also complete bathrooms and tile work for nicer investment properties, restaurants, hotels, nursing facilities, and senior homes. In fact, most commercial restrooms, even in high-end restaurants, are prime examples of awful tile work and could use some of our “love”. This usually stems from the builder or developer’s unwillingness to pay enough to get the job done right the first time. The result is an irritating eyesore of improper layouts, bad tile-setting, and poor grout work that is very noticeable to your clientele for years to come. From this perspective, it is ABSOLUTELY worth spending a few extra dollars to do the job correctly. At Simplicity, we use high quality materials and proper installation techniques, so there won’t be any trouble down the road. If that’s more important to you than a low price, we’re the guys for the job. Q: My tile shower pan is leaking, so I need to have it torn out and retiled, but I don’t want to replace the walls – they seem to be in good shape. Do you guys do that? A: We understand where you’re coming from. It seems like somebody should be able to cut the tile base out, fix and retile the area, and call it a day. Unfortunately, it’s a little more complicated than that. Repair jobs like this aren’t our thing – there are too many potential issues with seaming the tile and waterproofing, and significant potential liability. For these reasons, we insist on completing only full shower tear-outs and remodels. This way, we can guarantee that your new shower will be a complete, watertight system that is built to the same high standards all the way around. Q: Do you offer glass repairs, glass replacement, re-caulking, fixture and faucet repairs, tile repairs, or cultured marble repairs? A: We do not offer these services. We are a tear-out-and-replace bathroom remodeling company, and as such, our specialty is remodeling, not repairs. Q: We remodeled another bathroom a few years back, and the work took months. Is that what I should expect in working with you? A: No, unless we’re doing a large master bath remodel or there are significant issues with your home’s plumbing. This question usually comes from customers who have experienced a disorganized contractor who ran into problems he or she didn’t know how to properly address. Meeting reasonable timetables with these projects is a function of the contractor’s organizational and project management skills, as well as his or her knowledge of potential issues and how to address them. We recommend working with a sharp, educated contractor who communicates clearly and can explain in detail how any problems on your job will be addressed. Q: We would like to purchase our own materials and just have you guys install everything. Will that work? A: The short answer is yes – however, this approach can be problematic. We understand if a client buys a special towel bar or other small item, but we would greatly prefer to provide all of the major fixtures and materials for your job. This way, you can depend on us to ensure that everything is sized and ordered correctly for your exact application. This is part of the reason you hire professionals like us – to ensure that snags and hassles are minimized, and that the details are left to our trained professional eyes. Here’s an example of why this can be an issue. Some time ago, we worked with a client who had visited a discount house and purchased a particular ceramic tile with a high-gloss finish. Even after being informed that the tile’s finish tended to crack and flake at the edges when cut, they still wanted us to build their shower walls from this tile and “do our best” with it, since they had bought it at a deep discount. Unfortunately, this was a discount tile for a reason. Just as we feared, when we cut the tile, the finish flaked badly and the cut edges exposed more of the orange-brown ceramic base color underneath than was expected. The client ended up having us paint the edges of the tile to help cover up the areas where the finish had flaked, so their discount tile ended up not being a great cost-saving option after all. We will go to great lengths to avoid these kinds of situations by informing and having up-front conversations with our clients. Just like working with any other professional, when you trust the person you work with and rely on their expertise to guide you, the outcome is typically much better! Q: I’m calling a bunch of people to give me free estimates and information for a master bath project. When can you come? A: As a company, we maximize efficiency by keeping in-home visits reserved for serious customers that are the best “fit” for our services. So, our first step is to schedule a phone consultation to discuss your needs, scope, and budget – and most importantly, what you’re looking for in a remodeler. 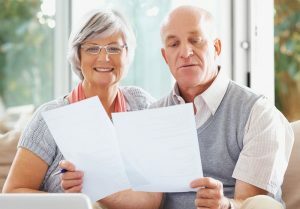 We’ll listen to what you’re trying to accomplish, then ask a few questions of our own; if it seems like we’ll be a great fit, then we can move on to step two – an in-home consultation. If you’re interested in a bathroom remodel but would like to move at a more deliberative pace, our Design First program may be perfect for you. With Design First, we enter into a design agreement and approach the project from a longer-term standpoint, taking more time to get a plan of action together and make selections. See our Services section for more details.